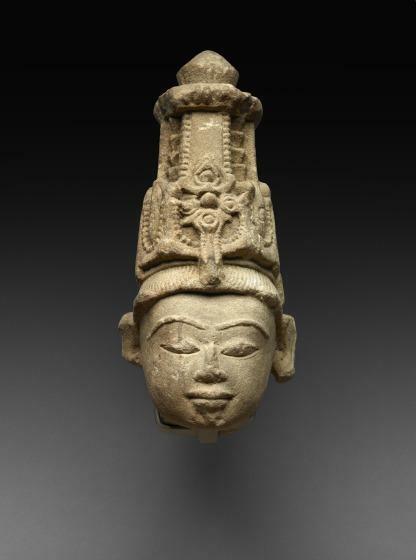 This head is possibly part of a figure that once adorned the exterior of a temple in northern India, probably in the northern part of Madhya Pradesh or Uttar Pradesh states. 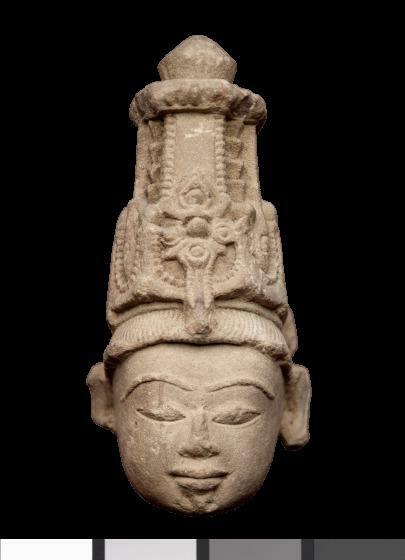 The tall crown is similar to the one worn by the deity Vishnu, although in the absence of other features, it is not possible to determine the identity of this figure. The date of the work, about the 15th or 16th century, provides an important reminder that Hindu temples continued to be made even during periods when Muslim kings ruled large parts of India. Often it is imagined that a sense of Muslim iconoclasm dominated the period, that Hindu temples were routinely desecrated, and that there was no new temple construction. However, some Muslim rulers, for example the Mughal monarch Akbar (1556-1605), sponsored the construction of Hindu temples and commissioned the translation of Sanskrit epics. "Male Head with Crown," File on TAZ.